One small patch of Stinging Nettle! Bristly herb with few branches. Has a height from 3-6 feet and a width of 2-3 feet. Even a slight pressure releases fluid from a capsule at the base of each hollow stinger hair. Handle with CARE! leaf: oval, coming to a point, deeply serrated around the edge, downy covered with stinging hairs to 6 inches long. flower: The flowers are small, white, loosely clustered. Leaf: Early Spring before plant flowers As the plant matures through the Summer it not only gets tougher and older, it developes cystoliths in the leaves, which are irritating to the kidneys. Often, when you are eating wild “greens,” they are harvested in the earlier part of the season. Stinging Nettle likes to grow in moist areas along streams and in woodlands. Using gloves and long sleeves break off top 2 brackets of early Spring leaves. Do not eat dried Nettles raw. You can try turning raw leaves in on themselves and crushing the stingers thus rendering them inactive and harmless. The formic acid (the stinging part) dissipates when you cook it or dry it or put it in vinegar or oil to infuse. 1. In the United Kingdom an annual Stinging Nettle Eating Championship draws thousands of people to Dorset, where competitors attempt to eat as much of the raw plant as possible. Competitors are given 60 cm (20 in) stalks of the plant, from which they strip the leaves and eat them. Whoever strips and eats the most stinging nettle leaves in a fixed time is the winner. The competition dates back to 1986, when two neighbouring farmers attempted to settle a dispute about which had the worst infestation of nettles. Remember, nettle does sting so consider wearing long pants, long sleeves, and gloves when you harvest. Pick the top leaves, bending the stem and finding its natural break point. (The number of leaves will vary with the size of the plant.) If you take only the tops, you leave your nettle patch healthy and growing so that you can harvest again and again until the plants begin to flower. You want to have your nettle harvest completed by the time the flowers appear, so pick plenty. Cook some and dry the rest (lying them out on screens in a dry place out of direct sunlight, or putting them in a dehydrator on low) for future use. When I think of our family’s herbal medicine chest, stinging nettle definitely figures prominently within it, though you might not recognize our use of it as medicinal. Nettle provides deep, herbal nourishment. Its leaves are packed with vitamins and minerals and they are a great source of protein. We start picking nettle leaves when the first plants are about 4 inches tall, and integrate them into our diet right away. Those first leaves give our bodies a wonderful boost to help with our transition from the dark, still winter into light and busy spring. As I’ve apprenticed herbalism over the last few years, I’ve come to realize that using medicines to treat a particular ailment is only a small part of maintaining health. Nourishing, healing herbs have become part of our family’s regular diet, helping us to continually build and maintain our health so that we don’t catch the bugs that are circulating through our community, and our bodies are able to heal quickly when necessary. To make a nourishing nettle soup, sauté onions and carrots briefly in a soup pot. Add potatoes and chopped nettles (leaves and tender stems). Add stock or water to cover the vegetables and simmer about twenty minutes. Add tamari or soy sauce to taste. This soup is a staple spring food at our house, and during my pregnancies it easily boosted my iron levels so that I didn’t need a supplement. I also drank nettle infusions throughout my pregnancy and the first couple of years after giving birth. Infusions are basically very strong teas. To make one, put one ounce of dried herbs into a quart jar (get bulk dried nettle by thge pound here) and pour enough boiling water over them to fill the jar. Cap it and let it sit for at least four hours. Strain it and drink it at your preferred temperature (warmed, chilled, or as is). I am in the habit of making and drinking an infusion every day. I start the infusion steeping while I’m making breakfast, and usually drink it with my dinner. I think of it as my daily multi-vitamin. Because I’m drinking it as a tea, my body is able to easily assimilate the nutrients. Now that I’m past the childbearing part of my life, I find myself adding nettle to my infusions when I’m feeling particularly tired or worn out. The beautiful deep green color and earthy smell connect me immediately to the healing green world, and I relish the taste and the feeling of energy and health in my belly and body. Stinging nettle or common nettle, Urtica dioica, is a herbaceous perennial flowering plant, native to Europe, Asia, northern Africa, and North America, and is the best-known member of the nettle genus Urtica. The plant has many hollow stinging hairs called trichomes on its leaves and stems, which act like hypodermic needles that inject histamine and other chemicals that produce a stinging sensation when contacted by humans and other animals. The plant has a long history of use as a medicine and as a food source. Stinging nettle is a dioecious herbaceous perennial, 1 to 2 m (3 to 7 ft) tall in the summer and dying down to the ground in winter. It has widely spreading rhizomes and stolons, which are bright yellow as are the roots. The soft green leaves are 3 to 15 cm (1 to 6 in) long and are borne oppositely on an erect wiry green stem. The leaves have a strongly serrated margin, a cordate base and an acuminate tip with a terminal leaf tooth longer than adjacent laterals. It bears small greenish or brownish numerous flowers in dense axillary inflorescences. The leaves and stems are very hairy with non-stinging hairs and also bear many stinging hairs (trichomes), whose tips come off when touched, transforming the hair into a needle that will inject several chemicals: acetylcholine, histamine, 5-HT or serotonin, and possibly formic acid. This mixture of chemical compounds cause a painful sting or paresthesia from which the species derives its common name, as well as the colloquial names burn nettle, burn weed, burn hazel. U. dioica subsp. dioica (European stinging nettle). Europe, Asia, northern Africa. U. dioica subsp. gansuensis. Eastern Asia (China). U. dioica subsp. gracilis (Ait.) Selander (American stinging nettle). North America. U. dioica subsp. holosericea (Nutt.) Thorne (hairy nettle). North America. Other species names formerly accepted as distinct by some authors but now regarded as synonyms of U. dioica include U. breweri, U. californica, U. cardiophylla, U. lyalli, U. major, U. procera, U. serra, U. strigosissima, U. trachycarpa, and U. viridis. Other vernacular names include tall nettle, slender nettle, California nettle, jaggy nettle, burning weed, fire weed and bull nettle (a name shared by Cnidoscolus texanus and Solanum carolinense). Stinging nettles are abundant in northern Europe and much of Asia, usually found in the countryside. It is less gregarious in southern Europe and north Africa, where it is restricted by its need for moist soil. In North America it is widely distributed in Canada and the United States, where it is found in every province and state except for Hawaii and also can be found in northernmost Mexico. It grows in abundance in the Pacific Northwest, especially in places where annual rainfall is high. In North America the stinging nettle is far less common than in northern Europe. The European subspecies has been introduced into North America as well as South America. In the UK stinging nettles have a strong association with human habitation and buildings. The presence of nettles may indicate that a building has been long abandoned. 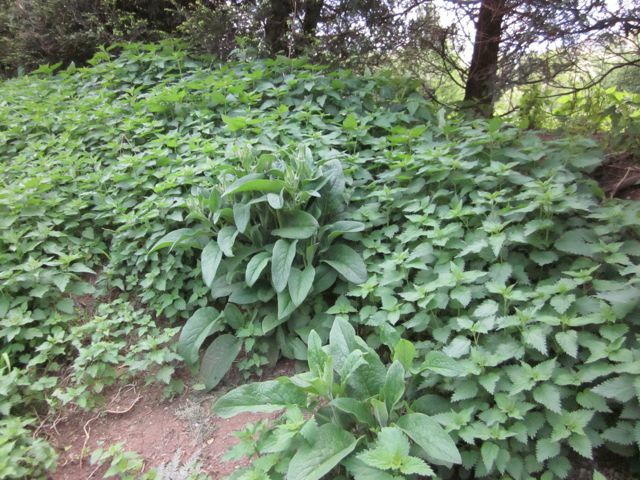 Human and animal waste may be responsible for elevated levels of phosphate and nitrogen in the soil, providing an ideal environment for stinging nettles. Nettles are the exclusive larval food plant for several species of butterfly, such as the Peacock Butterfly or the Small Tortoiseshell, and are also eaten by the larvae of some moths including Angle Shades, Buff Ermine, Dot Moth, The Flame, The Gothic, Grey Chi, Grey Pug, Lesser Broad-bordered Yellow Underwing, Mouse Moth, Setaceous Hebrew Character and Small Angle Shades. The roots are sometimes eaten by the larva of the Ghost Moth Hepialus humuli. Detail of flowering stinging nettle. Detail of immature fruits of stinging nettle. As Old English Stiðe, nettle is one of the nine plants invoked in the pagan Anglo-Saxon Nine Herbs Charm, recorded in the 10th century. Nettle is believed to be a galactagogue and a clinical trial has shown that the juice is diuretic in patients with congestive heart failure. Urtication, or flogging with nettles, is the process of deliberately applying stinging nettles to the skin in order to provoke inflammation. An agent thus used is known as a rubefacient (something that causes redness). This is done as a folk remedy for rheumatism, providing temporary relief from pain. The counter-irritant action to which this is often attributed can be preserved by the preparation of an alcoholic tincture which can be applied as part of a topical preparation, but not as an infusion, which drastically reduces the irritant action. Extracts can be used to treat arthritis, anemia, hay fever, kidney problems, and pain. Nettle leaf is a herb that has a long tradition of use as an adjuvant remedy in the treatment of arthritis in Germany. Nettle leaf extract contains active compounds that reduce TNF-α and other inflammatory cytokines. It has been demonstrated that nettle leaf lowers TNF-α levels by potently inhibiting the genetic transcription factor that activates TNF-α and IL-1B in the synovial tissue that lines the joint. Nettle is used in shampoo to control dandruff and is said to make hair more glossy, which is why some farmers include a handful of nettles with cattle feed. It is also thought nettles can ease eczema. Nettle root extracts have been extensively studied in human clinical trials as a treatment for symptoms of benign prostatic hyperplasia (BPH). These extracts have been shown to help relieve symptoms compared to placebo both by themselves  and when combined with other herbal medicines. Fresh nettle is used in folk remedies to stop bleeding because of its high Vitamin K content. Meanwhile, in dry U. dioica, the Vitamin K is practically non-existent and so is used as a blood thinner. A young red-tinted variety of American stinging nettle. Stinging nettle has a flavour similar to spinach when cooked and is rich in vitamins A, C, iron, potassium, manganese, and calcium. Young plants were harvested by Native Americans and used as a cooked plant in spring when other food plants were scarce. Soaking nettles in water or cooking will remove the stinging chemicals from the plant, which allows them to be handled and eaten without incidence of stinging. After Stinging Nettle enters its flowering and seed setting stages the leaves develop gritty particles called “cystoliths”, which can irritate the urinary tract. In its peak season, stinging nettle contains up to 25% protein, dry weight, which is high for a leafy green vegetable. The young leaves are edible and make a very good pot-herb. The leaves are also dried and may then be used to make a tisane, as can also be done with the nettle’s flowers. Nettles can be used in a variety of recipes, such as polenta, pesto and purée. Nettle soup is a common use of the plant, particularly in Northern and Eastern Europe. In Nepal and the Kumaon region of Northern India, Stinging Nettle is known as Shishnu. It is a very popular vegetable and cooked with Indian spices. Nettles are sometimes used in cheese making, for example in the production of Yarg and as a flavouring in varieties of Gouda. In the UK, an annual Stinging Nettle Eating Championship draws thousands of people to Dorset, where competitors attempt to eat as much of the raw plant as possible. Competitors are given 60 cm (20 in) stalks of the plant, from which they strip the leaves and eat them. Whoever strips and eats the most stinging nettle leaves in a fixed time is the winner. The competition dates back to 1986, when two neighbouring farmers attempted to settle a dispute about which had the worst infestation of nettles. Nettle cordial is a soft drink made largely from a refined sugar and water solution flavoured with the leaves of the nettle. Historically it has been popular in North Western Europe; however, versions of a nettle cordial recipe can be traced back to Roman times. It is an aromatic syrup, and when mixed with sparkling water, is very refreshing. Nettle leaves are steeped in a concentrated sugar solution so the flavour is extracted into the sugar solution. The leaves are then removed and a source of citric acid (usually lemon juice) is added to help preserve the cordial and add a tart flavour. Commercially produced cordials are generally quite concentrated and are usually diluted by one part cordial to ten parts water – thus a 0.5 litres (0.11 imp gal; 0.13 US gal) bottle of cordial would be enough for 5.5 litres (1.2 imp gal; 1.5 US gal) diluted. The high concentration of sugar in nettle cordial gives it a long shelf life. There are also many recipes for alcoholic nettle beer, which is a countryside favourite in the British Isles. A hand with a large sting, with visible bumps on the skin. Anti-itch drugs, usually in the form of creams containing antihistaminics or hydrocortisone may provide relief from the symptoms of being stung by nettles. But due to the combination of chemicals involved other remedies may be required. Calamine lotion may be helpful. Many folk remedies exist for treating the itching including horsetail (Equisetopsida spp. ), leaf of dock (Rumex spp. ), Jewelweed, (Impatiens capensis and Impatiens pallida), the underside of a fern (the spores), mud, saliva, or baking soda, oil and onions, and topical use of milk of magnesia. In Great Britain the stinging nettle is the only common stinging plant and has found a place in several figures of speech in the English language. Shakespeare‘s Hotspur urges that “out of this nettle, danger, we pluck this flower, safety” (Henry IV, part 1, Act II Scene 3). The figure of speech “to grasp the nettle” probably originated from Aesop‘s fable “The Boy and the Nettle”. In Sean O’Casey‘s Juno and the Paycock one of the characters quotes Aesop “Gently touch a nettle and it’ll sting you for your pains/Grasp it as a lad of mettle and soft as silk remains“. 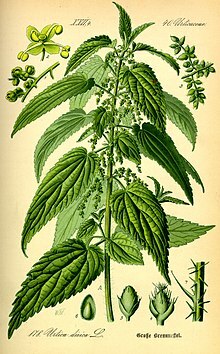 The metaphor may refer to the fact that if a nettle plant is grasped firmly rather than brushed against, it does not sting so readily, because the hairs are crushed down flat and do not penetrate the skin so easily. In the German language, the idiom “sich in die Nesseln setzen”, or to sit in nettles, means to get into trouble. Nettle stems contain a bast fibre that has been traditionally used for the same purposes as linen and is produced by a similar retting process. Unlike cotton, nettles grow easily without pesticides. The fibres are coarser however. In recent years a German company has started to produce commercial nettle textiles. As well as the potential for encouraging beneficial insects, nettles have a number of other uses in the vegetable garden. The growth of stinging nettle is an indicator that an area has high fertility (especially phosphorus) and has been disturbed. Nettles contain a lot of nitrogen and so are used as a compost activator or can be used to make a liquid fertiliser which although somewhat low in phosphate is useful in supplying magnesium, sulphur and iron. They are also one of the few plants that can tolerate, and flourish in, soils rich in poultry droppings. Recent experiments have shown that nettles may have some use as a companion plant. Stinging nettle can be a troubling weed, and mowing can increase plant density. Regular and persistent tilling will greatly reduce its numbers, the use of herbicides such as 2,4-D and Glyphosate, are effective control measures.